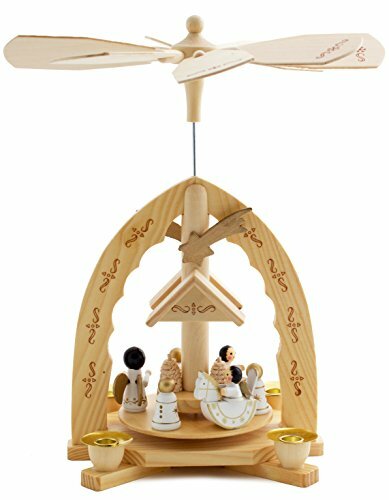 BRUBAKER Christmas Decoration Pyramid 12 Inches Nativity Play - Christmas Scene with Handpainted Angels - Handpainted Figures - Limited Edition 500 Pieces Only - Including 20 Candles (Made in Germany) by BRUBAKER at Two Clock. MPN: Pyramide_Angel_USA. Hurry! Limited time offer. Offer valid only while supplies last. The design by Henry Brubaker is inspired of the old traditional German craftsmanship. Here, the natural material wood in a loving way is enchanted. The design by Henry Brubaker is inspired of the old traditional German craftsmanship. If you have any questions about this product by BRUBAKER, contact us by completing and submitting the form below. If you are looking for a specif part number, please include it with your message.